BlackBerry Curve 8530, Gemini CDMA Version ~ " World Information "
Bored with the BlackBerry service operator's GSM? Move it to CDMA. Bakrie Connectivity in cooperation with RIM, the BlackBerry service brings Internet Service (BIS) through their AHA service. This is the cousin of Gemini. In terms of form factor and design pindang Curve 8530 in the split second tub with the Curve 8520 (Gemini). When weighed, the weight may Curve 3G that reached 105 grams exactly with Gemini, but more severe when compared with Onyx (9700). The design looks even smaller with dimensions of 109 x 60 x 13.90 mm and surrounded by an oval-shaped shell. Unfortunately the plastic edges are still without a layer of silver and 3G look cheap rather than the Curve. Turning to the back, this phone uses without rubber textured plastic cover. In the back right of the 2-megapixel camera also goes down without a flash. However, when tested detikINET inside and outdoors in bright conditions, capable of capturing images that fairly clean. But indeed, to dark conditions, the camera Curve 8530 is less reliable. While the upper body, RIM pin dedicated short-cut to the media. Such a shortcut to access music and video exactly as in Gemini. Trackpad on the phone is placed with a bit more prominent position or parallel to the keypad, just as hard with the Gemini. Somewhat less good when used for rapid typing. Understand it, keypnad in Curve 3G menggusung same model with a series of Gemini and the Javelin (Curve 8900). So if you are used to typing in a long time seemed less comfortable. This phone is QVGA resolution (320 x 240 pixels). Indeed, this screen is smaller than the Onyx. Problem-speed data, the AHA CDMA service may compete with GSM operators. "We offer Internet connections 77 times faster than GPRS. If on the other BlackBerry slow Insha Allah not with BlackBerry AHA," says Erik Meijer, Managing Director of PT Bakrie Connectivity, through the launch of the BlackBerry Curve 8530 some time ago. It is true what is said by Erik them. In some places, the AHA's EVDO network sometimes feels faster than a GSM operator's 3G network. Of course, with sayarat location reached by the nearest BTS. With CDMA Dual Band 800/1900 MHz, CDMA 2000 1X EVDO, when used for browsing from Cilandak area and Tebet, South Jakarta, the velocity does not disappoint. AHA claims its network speeds reaching 3.1 Mbps. 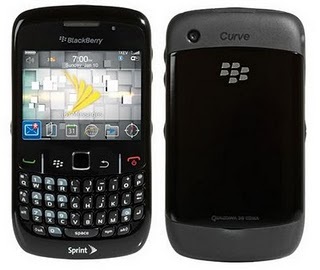 BlackBerry Curve 8530 has three applications that have been injected into this phone and a differentiator with a Curve version of GSM. They are the Bloc, bPrivate, and AHA vibe. Bloc function as locking the phone when in standby. Once turned on, users can enjoy the pages such as weather forecasts, watches, currency, or calendar. Just slide the touchpad to the right to enter the main phone application. While bPrivate is a security feature for passwords in the phone business. Users can also enjoy the service AHAVibe to download our favorite songs. Not enough, users can choose their desired number with the service numbers like-like from Esia. The most interesting bonus is a free service BlackBerry Internet Service (BIS) for half a year. Yes, to capitalize pulse pickup, users can already enjoy the push mail service, fuel, chat, and browsing. For video streaming service offered AHA apparently the same as other operators. BlackBerry Curve 8530 is basically exactly the same as the BlackBerry Curve 8520 (Gemini). All the features and conveniences offered, unfortunately must be redeemed at a normal price Rp 3.8 million. Sedkit too expensive for a phone-level Gemini. At its launch the AHA does give promotion price of USD 1.999 million plus Vat. Unfortunately the available stock at that time only 500 units and immediately sold out instantly. But given the speed offered, it could not hurt to try the Curve CDMA version of this.